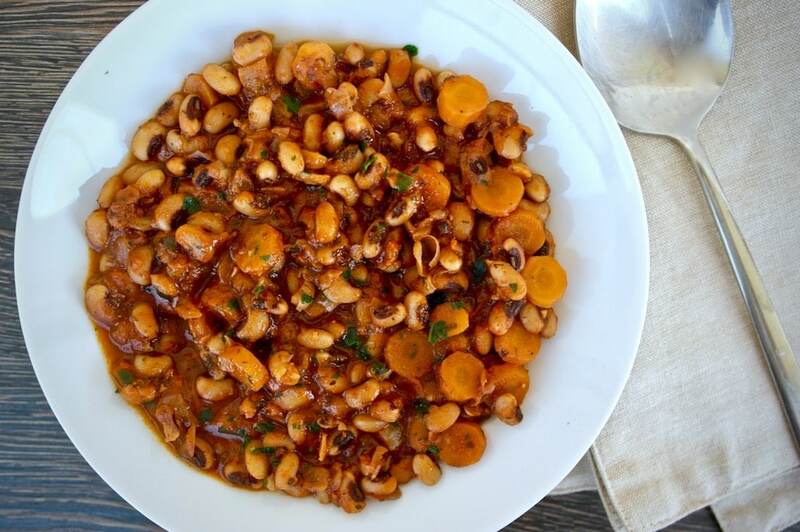 This is the classic way black eyed peas are prepared in Greece: stewed with onion, tomato and herbs until thick. This One Pot Greek Black Eyed Pea dish is hearty and good. It is often combined with spinach or other greens. While we often see black eyed peas in salad recipes, cooking them as a stew really brings out the flavor and that thick sauce. 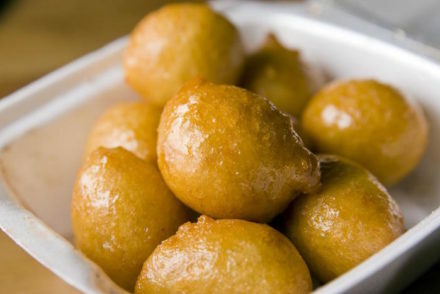 We often associate this bean with southern and Caribbean cuisine, but in fact they are quite a traditional food in Greece, we call them mavromatika. 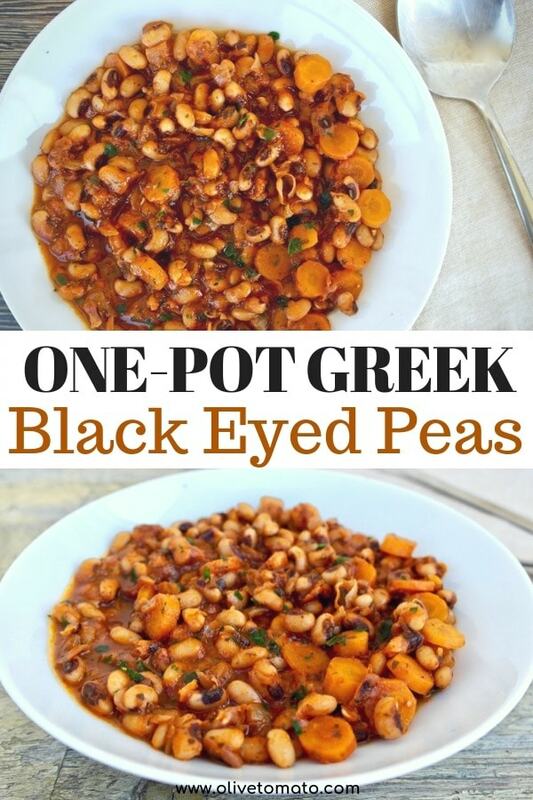 When we look at this recipe, it has many things in common with southern style black eyed peas (minus the meat): cooked on the stovetop with onions and herbs, these black eyed peas are very versatile, as you can add other greens, or other herbs depending on the season. Although it is called a “pea” it is actually a bean, and one of the healthiest ones. I find that it is underestimated in regards to its health benefits. Black eyed peas are full of nutrients, let’s see how much: 1 cup of cooked black eyed peas contain about 220 calories, 15 grams of protein and 11 grams of fiber. 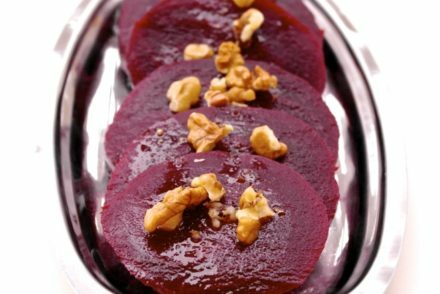 That in itself makes these beans a perfect food for those wanting lose weight, maintain balanced blood sugar levels and feel full and satisfied. But that’s not all, a cup of these wonder beans also contains high amounts of folate, iron, magnesium, copper and thiamin fulfilling over 20% of our daily needs for these vitamins and minerals. Black eyed peas are also a source of protective antioxidants. In addition to all this , they are better tolerated than other types of beans. One of the reasons black eyed peas are so great apart from their flavor and nutritional value, is that they very easy to prepare. You do not need to soak them overnight and they cook quite quickly. Since they are so easy to prepare, I recommend using dried beans rather than canned. If you intend to use them in a salad, you can soak them for 30 minutes. Then you rinse and simmer in plenty of water (make sure they are covered by 4 inches or 10 cm). They should be ready in about 30-40 minutes. If you are using them for a cold dish/salad you do not want to overcook, you do not want them mushy. 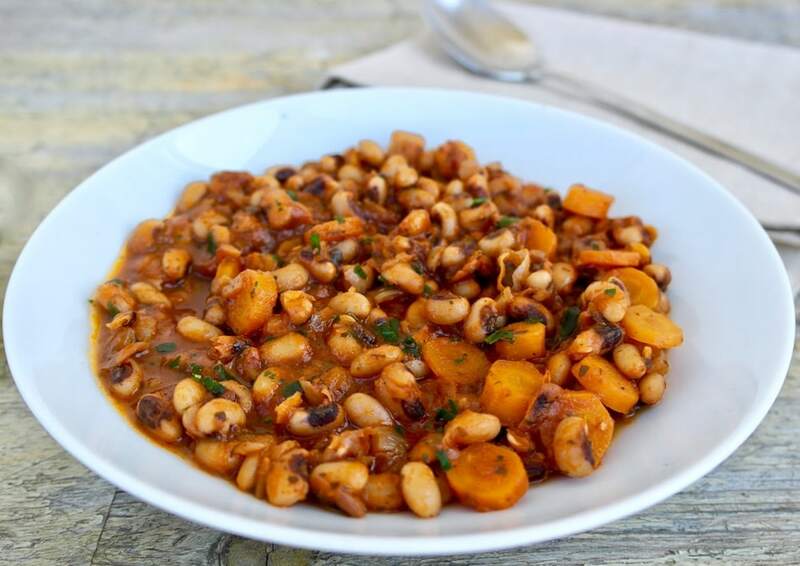 For this particular one-pot recipe, we will cook the black eyed peas along with tomato and water until they are stewed as you will see in the recipe below. Soak the black eyed peas in water for about 30 minutes. After that rinse in plenty of water. In a pot, heat 4 tablespoons of olive oil and sauté the chopped onion and the carrot until the onion is translucent. Add the black eyed peas to the pot and sauté for 1-2 minutes. Add the tomato, the bay leaf, dill and pepper and mix well. Add hot water until the beans are covered (about 1 inch over). Simmer for 30-40 minutes checking the water levels, add a bit of hot water as needed (about 2-3 tablespoons each time), you do not want this to be watery or like a soup, but thick. I prefer to add less water in the beginning and add as needed later. The beans are ready when they are soft. Remove from heat and remove the bay leaf, add salt to taste and mix. Serve as is or with a sprinkle of parsley. You may also accompany it with a piece of feta. How is bread typically made in Greece? is it with wheat, spelt, barley? What would be the healthier choice? Thanks! Thanks for your delightful blog, I’ve prepared many of your recipes and they’ve all been delicious! Small correction in step 3 – black eyed peas instead of chickpeas (sorry, I was an editor in a former life). This sounds delicious, I love black eyed peas! Hi elena, this recipe sounds lovely & I’m going to try it! Do you know how many carbs is in a portion? Thank you..
Hi Dolores, About 35-40 grams in 1 cup . Thank you for sharing George! And I love Lebanese food! Very interesting about digestibility. I love beans, but they don’t love me. I do find I have an easier time digesting old-world beans (like this family of beans) than new-world varieties – though I love black beans. Yes some varieties are easier on our digestive system than others. What other peas/beans are easier to digest? Love black eye peas of course. Hi Elena, as I just said on my Greek Liquid Gold: Authentic Extra Virgin Olive Oil Facebook page, where I shared a link to this, I have made white beans much like this, but never black eyed peas, which I’ve only used in salads. Now I want to try this, since its health benefits are even greater than I’d thought! I appreciate your letting us know about that. You suggest serving this with feta. However, I have heard that eating calcium and iron sources together inhibits iron absorption. Is that incorrect? Thanks Lisa. Yes calcium can hinder absorption of iron, although feta has moderate amounts of calcium. However studies show that in the long run this does not result in iron deficiencies. Thank you for your website! I made this for dinner; the fridge was almost empty as we are headed out of town for a week. But I had canned tomatoes and fresh herbs growing on my porch plus a couple of carrots that would have been composted otherwise. I had a container of previously frozen cooked white beans that also was destined for the compost, so I used those instead of black-eyed peas. My daughter doesn’t like dill, so I used oregano and rosemary; we ate it with rustic sourdough from a local bakery, drizzling extra olive oil over the top. Simple and utterly delicious! This dish represents the best of Greek comfort food! Not only that, but it’s also very healthy and makes for a nice vegetarian meal. Thanks for sharing, although it should not take that long for these particular beans to cook. Can I use black beans as a substitute? You could, but you would have to pre-soak them longer (at least 4-5 hours) as they take a bit longer to cook. 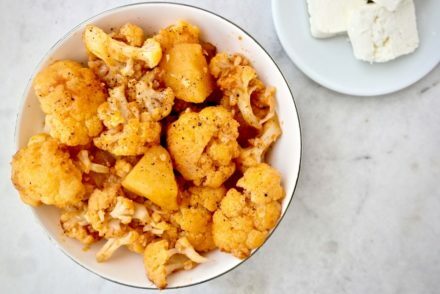 Elena, I made this dish the week after you posted the recipe, and it was delicious! Turned out to be quite sweet, and I think that’s because the carrots from our gardens had already gone through a few frosts (we’re in New England), which increases the sugars in the roots. Such a simple dish and so satisfying. One of our immediate favorites. Thanks for sharing it! I am so sorry to say , the right is black eyed pea it belongs to pea family their scientific name Vigna sp. which is belongs to pea family, athough the shape looks like bean, and many laguages named to bean. their taste when seed is green like pea too, and leaf and stalk has pea smell. so black eyed pea name is correct. Being Indian am new to Greek food. I have cooked black eye peas many time but this Greek style pea recipe was was delicious. Will cook again and again. 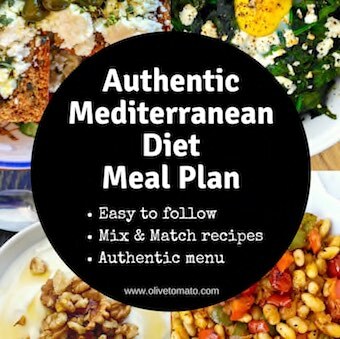 This recipe provoked me to try more Greek recipes. Thank you for sharing Punam.